A 22yrs man, previously fit and well, comes to see you holding an ECG. He explains he is a medical student. He, and few fellow students, were practicing doing ECG's on each other. 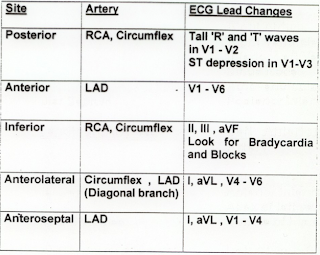 He became worried when he discovered the 'machine analysis' on his own ECG mentioned a variety of abnormal features. He denies any symptoms of chest pain/tightness, or palpitations. He has no significant past history, and has never been in hospital apart from a handful of A&E attendances with rugby injuries. Apart from being a little overweight, with slightly quiet heart sounds, examination is unremarkable. What are your thoughts when you see the ECG? 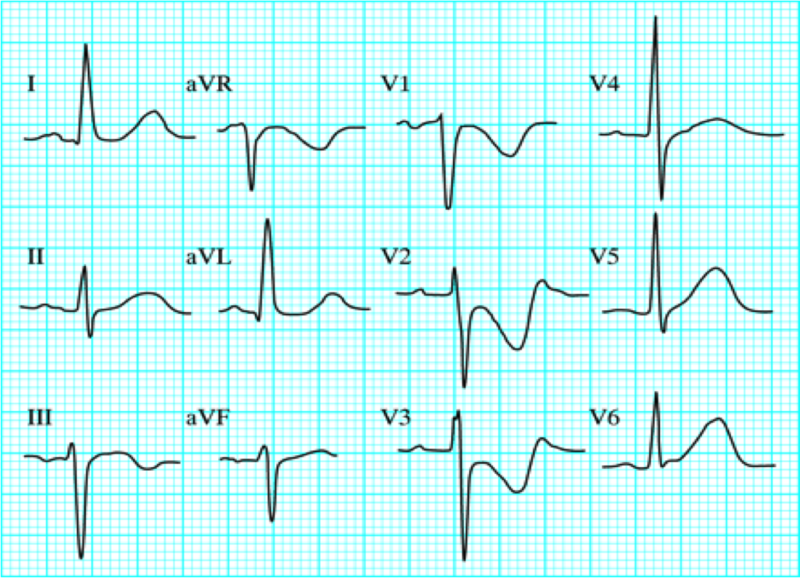 Clue: Remember, If you are ever baffled by and ECG, go back to first principals, and work through it systematically. Start with the axis, then the P waves. 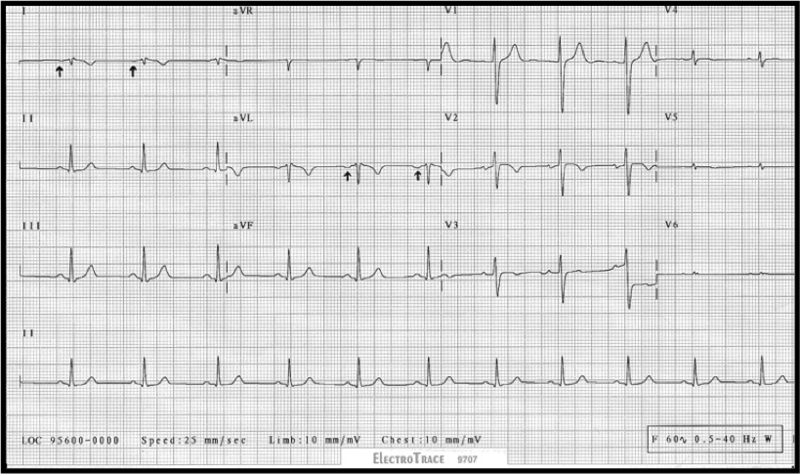 What is the axis on this ECG? Can you describe the P waves in each lead? 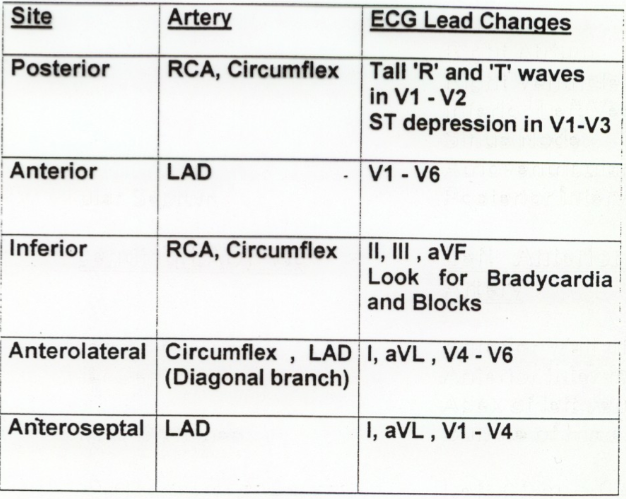 Remember the normal ECG axis? 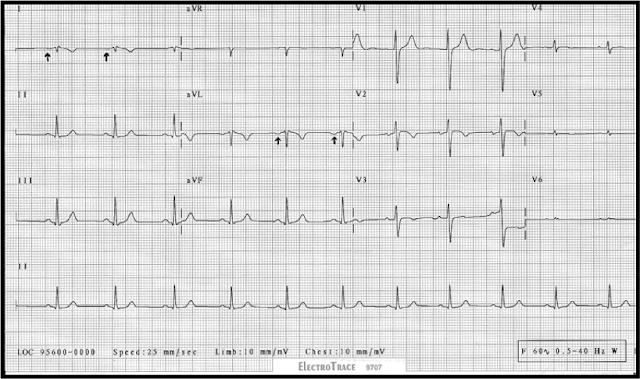 This ECG unusually shows Right Axis deviation of the P wave (the P wave is Negative in aVL and lead I) and Right axis deviation of the QRS complex (between +90 and +120 degrees). There is also very low voltage/amplitude in the precordial leads, V4 to V6 . Whilst this could be down to patient habitus impeding the electrical reading, or a pericardial effusion, if this was so you would expect to see low amplitude in all chest leads. 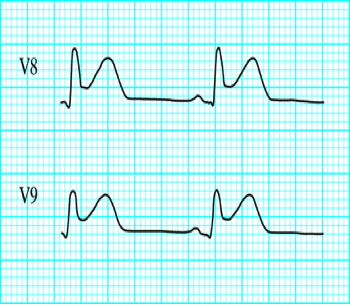 A normal ECG shows 'progression of the R wave' in the precordial leads. In other words the relative size of the R wave to the s wave increases gradually from V1 to V5. 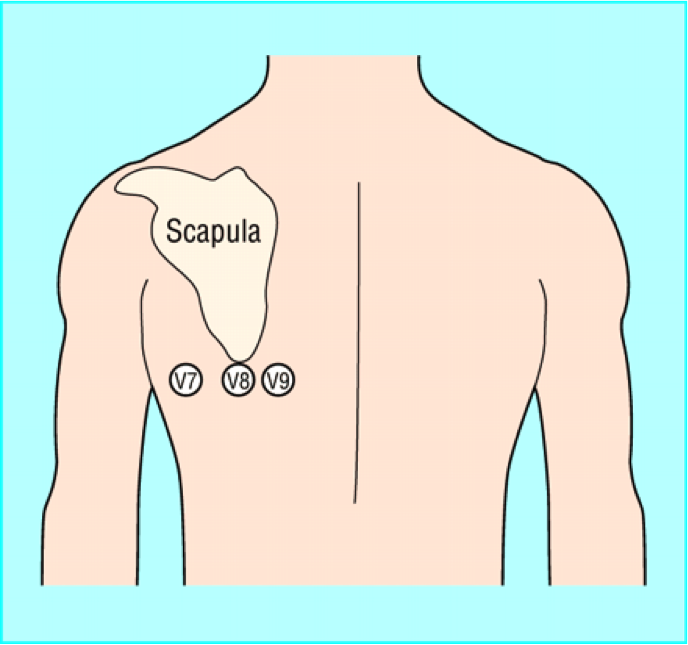 (V5 is often remains taller than V6 because of the attenuating affects of the lungs). In short, voltage and axis deflections are not as we would expect. admittedly, not clearly demonstrated in the above example. 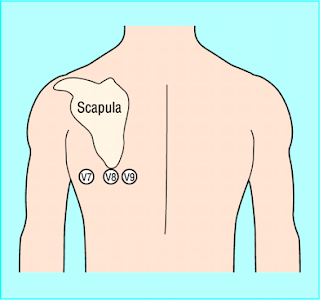 A similar ECG picture would be obtained in the limb leads, if the Right and Left limb leads electrodes had been accidentally reversed on placement. If this was the case, the chest leads would still appear normal showing natural progression of the R wave (maximum amplitude in V3-V4). Summary of Twitter discussion next week on #storify. New case the week after. 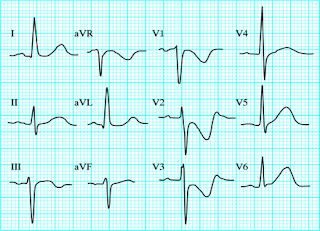 An ECG special request topic tonight. Slightly out of my field, so I'm relying on you experts out there to add your comments and educate us all at the end please! A new ECG "quizz" is launched alternate Wednesday evenings, in term time. Any discussions generated with be archived for summary and reflection, on the following interim Wednesdays, and stored at www.storify.com (Just search #ECGclass or @ECGclass). It's first thing Monday morning. The first of your same-day booked appointments wanders in at 9am. He's a 56yrs man who rarely attends, but he woke in the small hours of the night with 'indigestion'. The pain hasn't got any worse, but it's niggled on for several hours now, so his wife booked the appointment and insisted he came down to see you before work. He's never really suffered with indigestion before, but has no cardiac history or risk factors. He looks a little unsettled and restless, but nothing else of note. Apart from a slight tachycardia, his pulse is normal, and BP borderline elevated (he's visibly a bit anxious). Now, you too are anxious, and arrange a 999 ambulance for immediate transfer with telemetry. What does the ECG show? (Stick to describing the ST changes only). At a glance, with my GP head, I would have felt this showed anterior ischaemia. But, bear in mind, he has ongoing pain, at rest. This has to be assumed to be Acute Coronary Syndrome until proven otherwise. 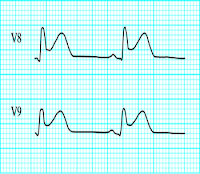 On arrival at hospital, serial troponins were taken, and the posterior ECG leads (V7-9) were monitored. A subsequent diagnosis of Posterior MI was made. With Acute MI, the presence of persistent ischaemic pain, indicates that still viable areas of ischaemic and injured myocardium are in danger of necrosis. It is outwith the concept of this forum, to go into management of Acute Coronary Syndrome (ACS) in any detail, but everyone should make themselves familiar with the NICE Guideline "Chest Pain of Recent Onset" (CG95). Pages 1-9 of the Quick reference guide linked above, deals with ACS, whereas pages 10 onwards, deal with stable angina. 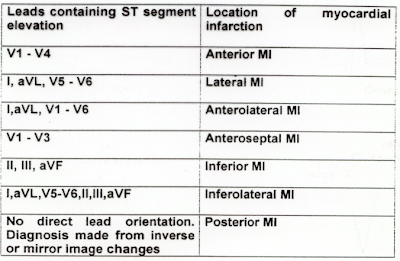 Of course, reliance on ST elevation to diagnose STEMI, assumes we are viewing the affected myocardium from the front. What if the ST elevation is in the posterior myocardial wall? If ST depression is present in leads V1-V3, with ongoing chest pain, then recording of the posterior leads (V7,V8,V9) will be invaluable. And so, the posterior ST elevation becomes obvious. 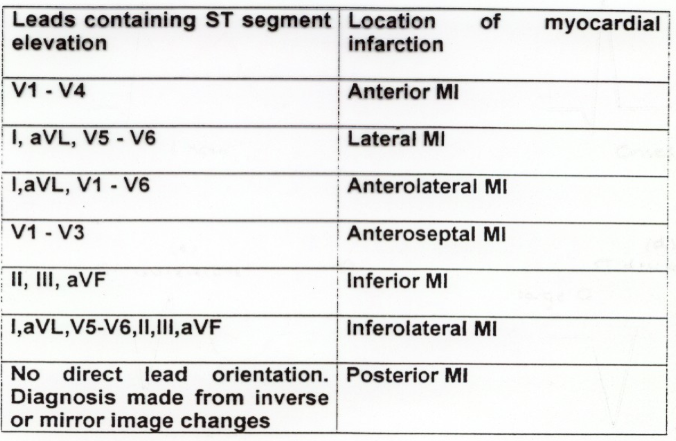 Posterior MI is often a bit of an enigma to GP's and students, and I'm sure we all recall been told to flip the ECG paper upside down, and view form the back. When lacking precious time/ability to monitor the posterior leads, this method can still be invaluable - it's just remembering to think of it!